Why 'bloke's paradise' lures the ladies Jump to media player BBC News visits a shop that caters for men, but is proving highly attractive to women. 'White privilege' got anarchist her shop Jump to media player After a Budget that promised to help to small businesses, BBC News visits an anarchist shop-owner who fears for her street. The cafe where everything is £1 Jump to media player BBC News visits a cafe in central London that is trying a new business model, selling all food items for one pound. 'My shirts last half a century' Jump to media player BBC News visits a designer who specialises in ''slow fashion''- making expensive clothes that she says will last half a century. Map boss's route to success Jump to media player Nigel Clifford, chief executive of Ordnance Survey, offers the business advice he wishes he had been given when he started out, for the BBC News series CEO Secrets. How to turn your head into chocolate Jump to media player BBC News visits a start-up based in London that is using 3D printing technology to make customised chocolate head lollipops. Boden: 'Better in pain than dead' Jump to media player Johnnie Boden, founder and CEO of the Boden fashion catalogue empire, offers the business advice he wishes he'd had when he started out, as part of the BBC News series, CEO Secrets. 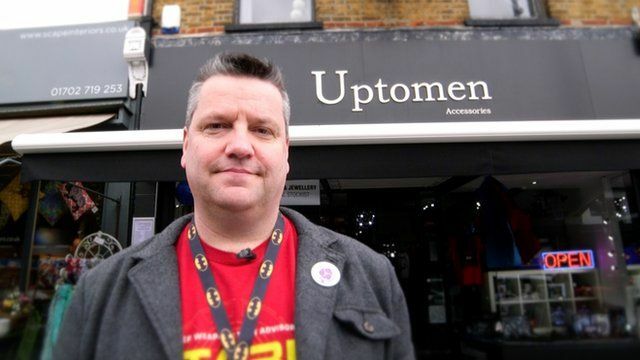 For four years Mike Wells has been running a shop in Leigh-On-Sea, Essex that caters specifically for men. He loves his gadgets, comics and gizmos and the shop fulfils his dream of building a 'bloke's paradise'. But he was surprised by the kind of clientele he ended up attracting. This video is a part of a new series from the BBC Business Unit called My Shop. The series profiles independent shops that follow a distinctive business model on the high street. To suggest a shop email us. For the latest updates about the series follow video journalist Dougal Shaw on Twitter. Consumer spending statistics are from the Nielsen report 'Brands risk losing the women of tomorrow! '.